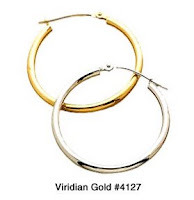 Some women like hinged hoop earrings because they are so easy to open and close. For the earring hinge to be well made, though, it is usually required that the earring be solid, rather than hollow. Otherwise, the hinge at the bottom of the earring cannot be concealed very well (you want it to virtually disappear when the earring is closed). 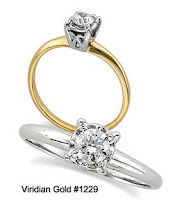 But solid earrings will weigh more, and cost more, than hollow ones. So, if you really like that pair of 24mm hinged hoops, make sure you check the weight of the pair! Many women find that anything over 3 or 4 grams per earring (we always give the weight for the pair, so divide it by two) feels too heavy on the ear piercing. In fact, we have stopped carrying large hinged hoop designs because our customers did not like their weight! The solution is to go with the hollow designs that use a snap-post closure, such as our #4127 1.4mm Round Tube Hoops, shown in the picture to the right. Hinged huggie designs, which fit close to the ear, will wear more comfortably, even though they are solid, because they are much shorter and therefore do not "swing" as much, which makes their weight less noticeable. 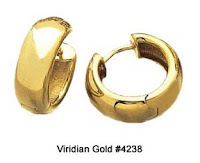 Our #4237 2.5mm Gold Huggies (left) are available in white or yellow 14K gold, are 2.5mm wide and weigh only about 1.5 grams each. 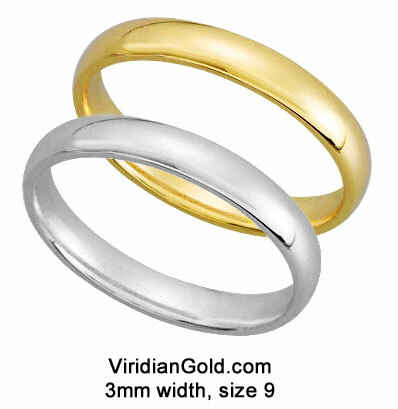 Wider huggies are proportionately heavier, such as our #4238 6mm Hinged Huggies, which are also available in either yellow or white 14K gold--they weigh about 3.2 grams each. 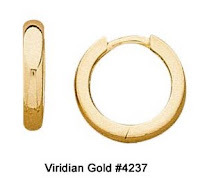 You can get help with earring terminology on the Viridian Gold website. We carry hundreds of styles of earrings, so be sure to check out our Earring Section to find that perfect pair!